Goran Dragic (1) finished with a game-high 28 points, 7 assists and 3 rebounds. INDIANAPOLIS (AP) — As one of the NBA’s elite teams, the Indiana Pacers have a target on their backs. The Phoenix Suns came out firing in the first half and held the Pacers off in the second to hand Indiana just its second home loss of the season. "This year they’re not the underdogs anymore," Suns forward Channing Frye said. "Teams come out and give it their best shot. For them to expect us to come in and lay down, for any team to lay down, it’s not going to happen." 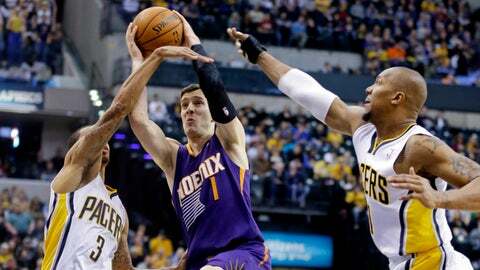 Goran Dragic had 28 points and seven assists to lead Phoenix to the 102-94 win over the Pacers on Thursday night. Gerald Green and Marcus Morris scored 16 points apiece to help the Suns win their fourth straight game. Markieff Morris, who finished with 15 points, hit a 3-pointer with 2:58 remaining to give the Suns a 98-92 lead and Dragic dunked to give the Suns a 100-94 lead with 44 seconds left to put the game out of reach. The Suns (28-18) seemed to have the game put away by halftime. Dragic scored 21 of the Suns 66 points in the first half — the most given up by the Pacers (35-10) in a half this season since the Suns scored 62 on Indiana a week ago in a 124-100 win. "We are at our best when we start the game well," Dragic said. "We played an up-tempo game, so I think they were a little bit tired." The Pacers rallied after trailing 66-49 at the break, but never retook the lead. Roy Hibbert had 26 points and David West added 18 for the Pacers, who have lost three of five games. Indiana went on an 8-2 run early in the second half with shots by David West, Paul George, Lance Stephenson and George Hill to get within 70-53. Later, George was fouled on a layup and converted the 3-point play to make it 71-61 with 7:01 left in the third. Miles Plumlee missed a dunk and Hibbert scored on a putback to get Indiana within eight. Frye answered with a basket and then Hibbert scored Indiana’s next six points to get the Pacers within 73-69. "We came out, got ourselves back in it in the second half with defense, but couldn’t get up over the hump," Hibbert said. "They outplayed us." The Pacers got within a point when Hill hit two free throws to make it 91-90 with 4:20 remaining, but Green extended the lead with two free throws. Hill made a layup before Green hit a jumper to put the Suns ahead 95-92 and Markieff Morris’ 3-pointer to give the Suns a five-point lead. "In the end, that third quarter cost us a little bit," Dragic said. "They came really strong. They made some open shots and that made it a little bit of a different game." It was much different from the way Phoenix played in the first half. They took a lead right away in the first quarter. They went on a 9-0 run early in the game when Dragic tied the game on a layup and later hit a jumper to give the Suns a 6-8 lead. Then Green hit a 3-pointer and another basket to make it 13-6 with 6:24 left in the first quarter. The Suns went on a 15-2 run to close out the first quarter with a 36-19 lead. Stephenson, who left the game in the first quarter after getting hit in the right eye, scored 12 second-quarter points. West added 10, but the Pacers were never able to put together a run or cut into the deficit. Even when George hit a jumper falling out of bounds that went over the corner of the backboard and through the hoop, it didn’t matter. Dragic hit a 3-pointer to take back the lead and to give the Suns a 62-45 lead.